Not one of mine, but this wonderful cake had to be shared. 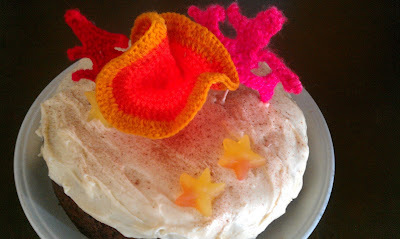 My friend Esther is incredible with a crochet hook, this is the awesome Coral reef cake she made for our friend Coral (see what she did there!? hehe) for her birthday. I am still reeling from the creative genius of this! (The extended reeling period may partially be because I am such a marine geek). The cake itself was carrot cake, with a lovely cream cheese frosting on top. This was sprinked with cinamon, and the crochet coral decorations were placed using cocktail sticks. The starfish are from a haribo funny mix.